This chapter describes components that fit into none of the categories defined in other chapters of this book: layout, tables, meters, charts, forms, controls, navigation aids, or popups. <colorWheel>  A continuous color gradient from which the user can select colors. <dynaView>  Display a view box based on data provided by a callback method. <finderPane>  A Finder-like browser for hierarchically organized data. <repeatingGroup>  Repeat the same layout for each item returned by a runtime query. <schedulePane>  Display a daily, weekly, or monthly calendar with time slots for each date. If you have examined the full roster of components, including those listed above, and still do not see the functionality you need, consider adding a custom component to the Zen library. For full instructions, see the Custom Components chapter in Developing Zen Applications. The Zen <html> component provides a way to place arbitrary HTML content within a Zen page. The HTML content is displayed within the Zen page exactly as specified. This content is drawn within an enclosing HTML <div> in the same manner as any other Zen component. The content must be well-formed. That is, any HTML elements within the content must have matching closing elements, and any attribute values must be quoted correctly. The <script> tag is not allowed. The content may not reference other Zen components. However, it may contain Zen #()# runtime expressions. Define a server-side OnDrawContent callback method that writes HTML content. If you define such a method, and reference it from the <html> element, this method is called whenever the <html> component is displayed. The <html> component has a content property that is a string of HTML statements. You can set the content property’s initial value by placing the desired HTML tags in between the <html> and </html> elements in XData Contents, or by referencing an OnDrawContent callback. Name of a server-side callback method in the Zen page class. This method provides HTML content using &html<> syntax or WRITE commands. To use the above method as the callback, the developer would set OnDrawContent="DrawMe" for the <html> component. seed Allows you to pass some arbitrary value to the OnDrawContent callback. The Zen <iframe> component is a wrapper for the HTML <iframe> element. It may display images or other content within a frame. longdesc URI that provides the link to the long (text) description of the frame. frameAlign The align value for the HTML <iframe>: "left", "right", or "center". The frameborder value for the HTML <iframe>. If true, the frame has a border; if false it does not have a border. scrolling The scrolling value for the HTML <iframe>: "auto", "yes", or "no". If you wish to change the contents of the frame from the client, you can do so programmatically by resetting the value of the src property of the iframe object. InterSystems advises that you do not use <iframe> to render image data streams. Instead, use <image> as described in the chapter Zen Controls. This convention is imperative when the image is in JPG format and the browser is Internet Explorer (IE). This topic explains the details. Suppose you want to use an <iframe> to render content retrieved from the database via a CSP routine that serves up a data stream. The stream could be PDFs, GIFs, JPGs, Docs, RTFs, etc. It turns out that, when the image is in JPG format and the browser is IE, rendering JPG data in an <iframe> incapacitates core Zen functionality. The root of the problem is in the way IE renders data streams. IE is different. It does not create a DOM; it swaps out normal page processing in favor of a dedicated viewer for the content in question. For ordinary web pages this is usually not an issue. If you are just loading a picture or downloading a PDF, there is nothing to interact with the DOM, so it does not matter if the DOM is there or not. The problem arises when the content is being loaded into an <iframe> under IE. Define the template display page with both an <iframe> and an <image>. Both components are initially hidden (hidden='true'). Query to find out what type of data is to be rendered. When the page is closing, reset the displayed component to be hidden (hidden='true') so that the page is ready for the next data stream. Other permutations are possible, but this is the basic idea. It is not necessary to use an <iframe> to display image data on a web page, and doing so with a JPG under IE breaks Zen, so do not use <iframe> for this purpose; use <image> instead. Number of milliseconds in the timer. Zen automatically starts the timer when the page is first loaded. When the timeout time has elapsed, Zen fires the ontimeout expression. The example above sets a timeout value of 10,000 milliseconds. This provides an timeout value of 10 seconds. A <fieldSet> is a group component that draws an outer box around the children and displays a title within this box. This creates a visual panel that can help to organize a page. The following example from the SAMPLES namespace class ZENApp.HelpDesk defines a panel called Details that contains a form with several different controls. <dataCombo id="Priority" name="Priority" label="Priority" size="12"
<dataCombo id="Customer" name="Customer" label="Customer" size="24"
<dataCombo id="AssignedTo" name="AssignedTo" label="Assigned To" size="24"
Zen group attributes <fieldSet> has the same style and layout attributes as any Zen group. For descriptions, see Group Layout and Style Attributes in the Zen Layout chapter of Using Zen. Text specifying the caption to display for this <fieldSet>. The legend can be a literal string, or it can contain a Zen #()# runtime expression. Text specifying a popup message to display for this <fieldSet>. The title can be a literal string, or it can contain a Zen #()# runtime expression. The <colorPane> component lets the user view and select colors or enter RGB values in a large color palette. The palette is a grid that can be visualized as one possible slice from a three-dimensional cube of available colors. The <colorPane> captures a slice from the cube by accepting the user’s choice of one of three faces (red, green, or blue) and slicing through the cube, parallel to that face, at some saturation level (brighter or dimmer) to produce a grid of colors. 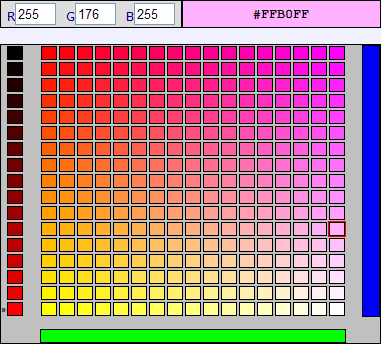 The user selects a color by clicking a square in the palette. The user can cycle through different faces and slices of the color cube by clicking on the red, green, or blue color bars at left, bottom, and right. The segmented bar at left allows the user to select a slice that uses a brighter or dimmer range of color combinations. The bar at top right displays the currently selected color and its corresponding HTML hexadecimal value. The user can copy (but not edit) the text value from this color bar. At top left, the user can change the text entry fields R, G, and B to any number in the range 0255, then click on the color bar at top right to apply these changes and see the result. The text fields R, G, and B also respond to user selections from the palette. <colorPane> is not a full-blown control component, but it does allow the user to select a value, and it can be used within Zen forms. Any control attribute not listed in this table is not available for <colorPane>. currCol 0based column number of the currently selected cell in the color palette. The default is 0. The range is from 0 to 15.
currRow 0based row number of the currently selected cell in the color palette. The default is 0. The range is from 0 to 15.
currSlice 0based slice number of the currently selected slice of the 3dimensional color cube. The default is 0. The range is from 0 to 15.
face Face number of the currently selected face of the 3dimensional color cube: 1, 2, or 3. The default is 1. The <colorWheel> component lets the user view and select colors from a continuous color gradient. The color wheel actually provides two different groups of controls. 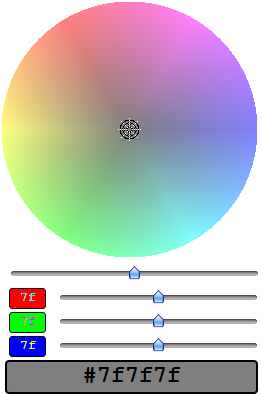 You can either use the color wheel and intensity slider to pick a shade from the wheel, or use the separate RGB sliders to mix a specific color. When you use the disk and intensity slider, move the slider to the left to see darker tones, or to the right to see lighter ones. The rendering of the disk offers real time feedback as to the current settings. Once you have the right range of colors displayed, click on the desired region of the disk. A cross-hair shows you where you clicked and the background of the preview box at the bottom of the widget updates to reflect your choice. Also, the RGB sliders update to reflect the selected color. When you use the RGB sliders, drag the sliders to adjust the contributions of the individual RGB color guns. The current value for each gun displays in the box to the left of the slider. The color resulting from the contributions of all three guns appears in the background of the preview box at the bottom of the control. Also, the intensity slider, color disk, and cross-hair location update to reflect the current color. showPreview Show the preview box at the bottom of the control that is filled with the currently selected color and stamped with the HTML Hex color specification. showRGBPanel Show the panel containing three sliders that allows the user to select values for the RGB color guns. A <repeatingGroup> is a specialized group component that defines the layout for a single group item, then outputs multiple items with this layout. The number of items, and the data contained in each item, is determined by a runtime query. Zen group attributes <repeatingGroup> has the same style and layout attributes as any Zen group. For descriptions, see Group Layout and Style Attributes in the Zen Layout chapter of Using Zen. The default layout for a <repeatingGroup> is vertical. 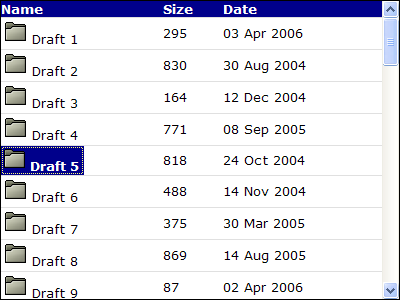 selectedIndex The (0based) index number of the currently selected item. The default value is 1, which indicates there is no current selection. The typical layout strategy for a repeating group is for the <repeatingGroup> element to enclose a horizontal group that contains the individual item. Since the default layout for a <repeatingGroup> is vertical, the result of this arrangement is that each item is laid out horizontally, while the set of items is laid out from top to bottom. The following excerpt from an XData Contents block provides an example of this layout strategy for <repeatingGroup>. This is similar to the XData Contents block in the class ZENTest.RepeatingGroupTest in the SAMPLES namespace. Note the <hgroup> that defines the individual entry. This <hgroup> contains a <button> and an <html> component. The following figure illustrates sample output from this excerpt. To produce this output, the user entered the key C, requested 10 rows, and then clicked Search. 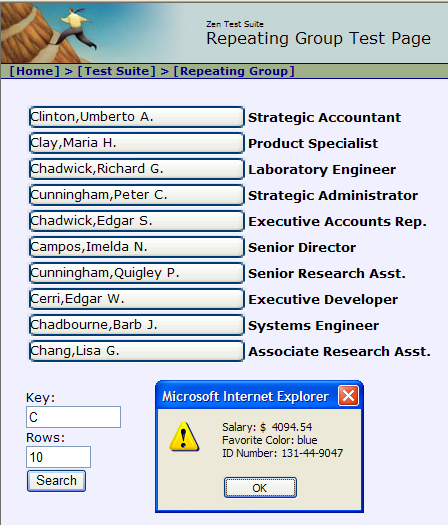 This caused Zen to display the repeating group using the first 10 entries that start with the letter C. The user then clicked an employee name in the group to display the alert window, which contains data retrieved from the server during the query. On the output side, only one object is created for each child of the repeating group, but there are multiple HTML renderings within that object, one for each child. The rendered HTML incorporates the current item number into each generated id value used to identify the HTML elements on the page. InterSystems recommends that you keep the use of <repeatingGroups> reasonably simple. Repeating groups within repeating groups are not supported. "list"  All items are displayed compactly in a grid. Only the first column of data is displayed. "details"  Each item is displayed as one row within a table. Each row may present several columns of data. A <dynaView> in details mode looks like the following example, based on the class ZENTest.DynaViewTest in the SAMPLES namespace. <dynaView> gets its data by invoking a server-side callback method defined in the Zen page class. The method name is specified using the <dynaView> OnGetViewContents attribute, as shown in the following example. In this example, the method name is GetViewContents. paramName The paramName must be unique within the <dynaView>. It becomes a subscript in the array of parameters passed to the callback method. The method returns a %Status value indicating success or failure. pParms represents any <parameter> elements defined by the <dynaView>. pParms is an array. Each member of this array uses its paramName as a subscript and its value as a value. The previous topic described the OnGetViewContents attribute in detail. The following table lists all the <dynaView> attributes. rows Number of rows to display when the <dynaView> is in list mode. selectedIndex 0-based index of the currently selected node in the <dynaView>. The default selectedIndex is 1 (nothing is selected). Each <parameter> element provided in the original <dynaView> definition in XData Contents becomes a member of the dynaView parameters property, a list collection of %ZEN.Auxiliary.parameter objects. Each <parameter> acquires an ordinal position in the parameters collection: 1, 2, 3, etc. The read-only text property holds the text (display) value of the currently selected node within the tree. This is the node label that displays in the <dynaView>. The read-only value property holds the logical (actual) value of the currently selected node within the tree. This is the string that is activated when the user clicks the corresponding label in the <dynaView>. A <schedulePane> displays a daily, weekly, or monthly calendar with time slots for each date. Users can define appointments and place them in the appropriate time slots. The following example shows a <schedulePane> in Week mode with several appointments defined. This example is similar to the class ZENTest.SchedulePaneTest in the SAMPLES namespace. <schedulePane> gets its data by invoking a server-side callback method defined in the Zen page class. The method name is specified using the <schedulePane> OnGetScheduleInfo attribute, as shown in the following example. In this example, the method name is GetScheduleInfo. 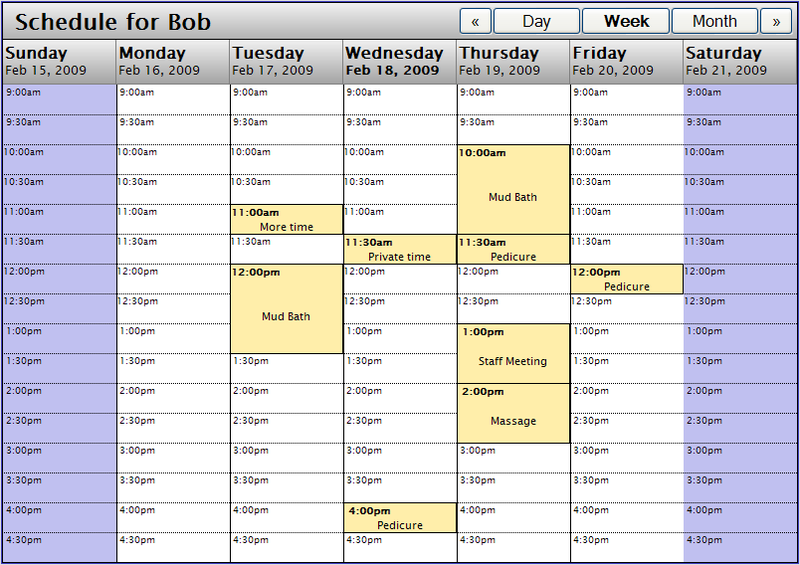 <schedulePane id="schedule" caption="Schedule for Bob"
paramName The paramName must be unique within the <schedulePane>. It becomes a subscript in the array of parameters passed to the callback method. The method returns a %Boolean value which is true to indicate success; otherwise it is false. pParms represents any <parameter> elements defined by the <schedulePane>. pParms is an array. Each member of this array uses its paramName as a subscript and its value as a value. Where both date and time are integers. pEndDate is the ending date and time in $HOROLOG ($H) format. day is the date in $HOROLOG ($H) format. time is an integer expressing the start time for this time slot as a number of minutes since midnight. Your code is more readable if you express this value as a calculated multiple of 60, using 9*60 for 9 a.m. instead of the literal value 540, but either is correct. n is an integer (starting with 1, and usually equal to 1) that you can use as needed to distinguish between time slots that have the same day and time values. duration is an integer specifying the number of minutes to reserve for this time slot in the schedule. id is an integer that the onselectitem event handler uses to uniquely identify this time slot when it is selected in the schedule. text is the text description to display in this time slot in the schedule. style is a CSS style to apply to this time slot in the schedule. This value overrides any competing styles that might otherwise apply to this time slot. Set pInfo(day) = "background: yellow;"
This topic has already described the OnGetScheduleInfo attribute in detail. The following table lists all the <schedulePane> attributes. Text to display as a caption along the top of the schedule. The text is not HTML escaped, so it can contain markup. The caption value can be a literal string, or it can contain a Zen #()# runtime expression. cellHeight Integer giving the height of time slots in the schedule calendar, in pixels. The default is 30, as shown in the illustration for dateFormat. Do not specify units with cellHeight. Date to display, in YYYY-MM-DD format. The default is the current date. The schedule calendar displays a range of days that contain this date value. The actual range depends on the current value of the view attribute: "day", "week", or "month". The date value can be a literal string, or it can contain a Zen #()# runtime expression. Integer that specifies the date format to use in the headers for the schedule calendar. The <schedulePane> automatically displays this date below the name of the day of the week. The default dateFormat is 1. This generates the date in the format Feb 18, 2009 as shown in the following illustration. As the illustration shows, you can also configure the headerHeight and cellHeight attributes for this part of the schedule calendar display. For a list of the integers you can use as values for dateFormat, see the description of dformat in the Parameters section for the $ZDATETIME ($ZDT) function in the Caché ObjectScript Reference. dateFormat allows nearly the same range of values as dformat. dateFormat supports 1 and the values 1 through 13. Comma-separated list of the full names of days of the week. The default dayList value uses the $$$Text macro with the English values Sunday through Saturday. Using this macro ensures that this dayList value is automatically included in the list of strings to translate for your application when you export them from the message dictionary, as long as you also set the DOMAIN parameter in the Zen class. For details, see the $$$Text Macros section in the Zen Localization chapter of Developing Zen Applications. You can use $$$Text with dayList because its ZENLOCALIZE datatype parameter is set to 1 (true). Any localized dayList string must remain a comma-separated list of seven items when translated. Be sure to coordinate dayList changes with shortDayList and firstDayOfWeek. Ending time for the daily time slots to be displayed on the schedule calendar. This is an integer expressing the number of minutes since midnight. The default endTime is 1080, which means 6 p.m. The range for endTime is 0 through 1440, which covers all 24 hours in the day. If the end user schedules an appointment that falls outside the startTime and endTime, the calendar expands to display that time slot. The endTime value can be a literal string, or it can contain a Zen #()# runtime expression. Integer that specifies which day of the week is displayed as the starting day of the week in the schedule calendar. 0 means Sunday, 1 means Monday, and so on up to 6, which means Saturday. The default firstDayOfWeek is 0. The purpose of the firstDayOfWeek attribute is to allow you to customize the schedule calendar for different locales. Be sure to coordinate firstDayOfWeek changes with dayList and shortDayList. headerHeight Integer giving the height of the header row at the top of the schedule calendar, in pixels. This header row is where Zen displays the names of days and their dates. The default is 40, as shown in the illustration for dateFormat. Do not specify units with headerHeight. interval Integer giving the number of minutes in each time slot on the calendar. The default interval is 30; the minimum is 5. The interval value can be a literal string, or it can contain a Zen #()# runtime expression. Comma-separated list of the full names of months of the year. The default monthList value uses the $$$Text macro with the English values January through December. You can use $$$Text with monthList because its ZENLOCALIZE datatype parameter is set to 1 (true). Any localized monthList string must remain a comma-separated list of twelve items when translated. Name of a server-side callback method in the Zen page class. This method gets the information needed to display the schedule. id  the user defined identifier for a scheduled item as provided by the OnGetScheduleInfo callback (or null for an empty cell). time  the time value associated with the cell (in yyyy-mm-dd hh:mm:ss format). You can use $$$Text with shortDayList because its ZENLOCALIZE datatype parameter is set to 1 (true). Any localized shortDayList string must remain a comma-separated list of seven items when translated. Be sure to coordinate shortDayList changes with dayList and firstDayOfWeek. You can use $$$Text with shortMonthList because its ZENLOCALIZE datatype parameter is set to 1 (true). Any localized shortMonthList string must remain a comma-separated list of twelve items when translated. Starting time for the daily time slots to be displayed on the schedule calendar. This is an integer expressing the number of minutes since midnight. The default startTime is 480, which means 8 a.m. The range for startTime is 0 through 1440, which covers all 24 hours in the day. The startTime value can be a literal string, or it can contain a Zen #()# runtime expression. view Specifies what type of schedule to display. Possible values are "day", "week", or "month". The default is "day". The view value can be a literal string, or it can contain a Zen #()# runtime expression. Each <parameter> element provided in the original <schedulePane> definition in XData Contents becomes a member of the schedulePane parameters property, a list collection of %ZEN.Auxiliary.parameter objects. Each <parameter> acquires an ordinal position in the parameters collection: 1, 2, 3, etc. The read-only selectedTime property holds the start time of the currently selected time slot in the schedule calendar. The selectedTime is an integer that gives the number of seconds since 0, at midnight. The read-only selectedInterval property holds the length, in minutes, of the currently selected time slot in the schedule calendar. Add the selectedInterval to the selectedTime to calculate an end time. The sample class ZENTest.FinderPaneTest in the SAMPLES namespace, illustrates the use of <finderPane> with <altJSONProvider>. The following example shows the code that creates the JSON component, and sets the OnGetArray callback to the method GetFinderArray, which is defined in the class. The next example shows the code that creates the finder pane. It sets the ongetdata property of <finderPane> to the getContentObject method of the <altJSONProvider> component. This method returns the client-side version of the data supplied by the <altJSONProvider>. The properties onselectitem, ondrawdetails, and ondrawempty are set to methods defined in the class. If true, then animate the appearance of the finder. The default is true. Text to display as a caption along the top of the finder. The text is not HTML escaped, so it can contain markup. The caption value can be a literal string, or it can contain a Zen #()# runtime expression. Width of columns in the finder when in "columns" mode. The default is 200 pixels. Use the viewType attribute to select columns mode. The default icon to display for folder items in icons mode. Use the viewType attribute to select icons mode. The default value is the filename of an image file suppled by the system. You can use this attribute to set a different default image. The filename specifies the path from the csp/broker directory under the Caché install directory. The ongeticon event handler can return different image files for items displayed in the finder. If true, then apply a high light color to the top-level rows in "list" mode. The default is false. The default icon to display for items in icons mode. Use the viewType attribute to select icons mode. The default value is the filename of an image file suppled by the system. You can use this attribute to set a different default image. The filename specifies the path from the csp/broker directory under the Caché install directory. If defined, this is a list of properties that supply the column values in 'list' mode. The oncancel event handler: If defined, handles the event fired when the user presses the escape key within the finder. The ondblclick event handler: If defined, handles the event fired when the user double-clicks on an item within the finder. The ondrawdetails event handler: If defined, handles the event fired when an item with no children is selected. If this event handler returns a value, then it is used as DHTML to render the item details. The ondrawempty event handler: If defined, handles the event fired when there is no data available to display within the finder. If this event handler returns a value, then it is used as DHTML providing content for the empty finder. The ondrawitem event handler: If defined, handles the event fired when an item within the finder is about to be drawn. If this event handler returns a value, then it is used as DHTML to render the item contents. The ongeticon event handler. If defined, handles events fired when the finder is in "icons" view and returns the url of the icon to use for the current item. If it returns "" (the empty string), then the default icon is used. The current item is passed to the event handler as an item. The onselectitem event handler. If defined, handles the event fired when the user clicks on an item within the finder. User-defined set of parameters. These are currently not used by the finder. This is a list of numbers (0-based) indicating the current selected item(s). The first number is the index in the top-most list of items; the second is the index within the children of the top-most item and so on. The default icon to display for the button that enables users to move up a level when the finder is in icons mode. Use the viewType attribute to select icons mode. The default value is the filename of an image file suppled by the system. You can use this attribute to set a different default image. The filename specifies the path from the csp/broker directory under the Caché install directory. icons  arranges items in a grid, with an image representing each item. list  arranges items in a vertical list. columns  arranges items in columns. The default value is columns.